Who are the little people? Now, what interested me was the little people: who were these little people who leave their offspring in a human cradle? It is... are they... are they fairies, or gnomes? Are they dwarfs – who? Because again, these figures, these fairies and gnomes and dwarfs are in every culture – there are stories about them. Now, I thought for a very, very long time that they existed. Why should they not exist? We have people of all sizes – why should there not have been fairies and gnomes and dwarfs and so on, and so on? Can I... can I remind you that in the Bible it says about – just thrown away, of course – that there were giants in those days. Well, maybe there were giants, we don't know that there weren't. We have occasionally come on... come on large skeletons, but is this what is meant? I don't know. But what they have recently come on – in Indonesia last year – they came on the skeletons of little people, that is, not human, but near human. Us, but small. Now, I thought, ah, there we go, you see. Now, needless to say, it... the academics, the scientists, are now arguing about it. They are saying, no, no, it's impossible, and the others say, no, it's not... it is possible, and here is the skeleton. And it's... it's in the papers, and it's a very interesting debate, this one. I think they're called the Flores... the Flores People... the Little Humans. Now, a long time ago – does anybody here know the name Charles Fort... Forte [sic] the man who was always writing books about impossible events. What he would do – this is... we're going back to the 50s now – he would go through newspapers and any kind of magazine, and take out any improbable story and event and print it. It didn't matter what it was, it didn't matter whether it was true, possible, impossible, it was printed. One of the stories he printed was of little people... little skeletons in the Alleghenies in America. And I thought, aha, there we are – he says it was years ago; I thought, there we are, it's there! And from time to time... and I believe in South Africa they've found little humans, and of course they debated were they really humans, were they...? I don't know what they were, but little skeletons. So there we are, you see – I start off with the idea that there were little people of some kind, we don't know what – they are in our folklore and our stories, but we don't know anything about them until we come on skeletons as the Flores People in Indonesia. And then we can say they were... they had brains as good as ours, apparently, these people, they were just as intelligent as we are, but they were smaller in scale. And there it rests at the moment. Now, if you look at the world now, never mind about Charles Fort and 50 years ago in the Alleghenies or Indonesia... if you contrast the pygmies in Central Africa who might never get taller than three foot, three-and-a-half feet or four feet, with the people over on the East Coast who might easily be seven feet, seven-and-a-half feet, and where do you see them now? You see them in America as doormen in hotels, these enormously tall elegant men. Most men, as they come into the lobbies, they look up at these creatures – they are giants, according to our ideas, and they are... there they are over in the coast of East Africa; and you contrast them with the pygmies, and what do you have? We have giants and we have pygmies now. 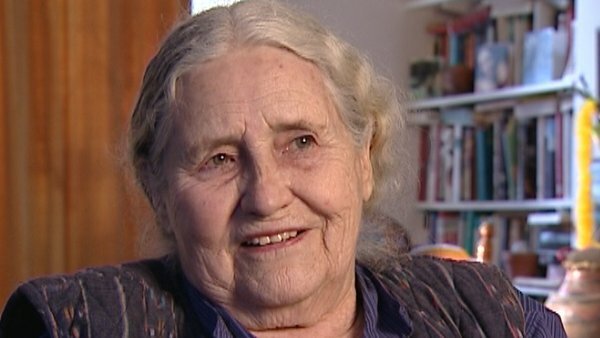 British writer Doris Lessing (1919-2013) was awarded the 2007 Nobel Prize in Literature. Her novels include 'The Grass is Singing', 'The Golden Notebook', and five novels collectively known as 'Canopus in Argos'. She was described by the Swedish Academy as 'that epicist of the female experience, who with scepticism, fire and visionary power has subjected a divided civilisation to scrutiny'. Lessing was the 11th woman and the oldest ever person to receive the Nobel Prize in Literature. Title: Who are the little people?